Hi, it’s Heather! This post is actually an excerpt from Local Bubbly, an article I wrote for CITIZEN, a new Rochester area magazine. In the first part of the article (which can be seen in our post The Sparkling Finger Lakes), I shared our tasting notes on three local sparkling wines – Chateau Frank Blanc de Blancs, Swedish Hill Riesling Cuvée, and Hunt Country Chardonnay Champagne. While all of these sparkling wines were fantastic on their own, during our tasting session, we decided to mix a bit of flavored simple syrup in with each of the wines to create a trio of tasty cocktails. 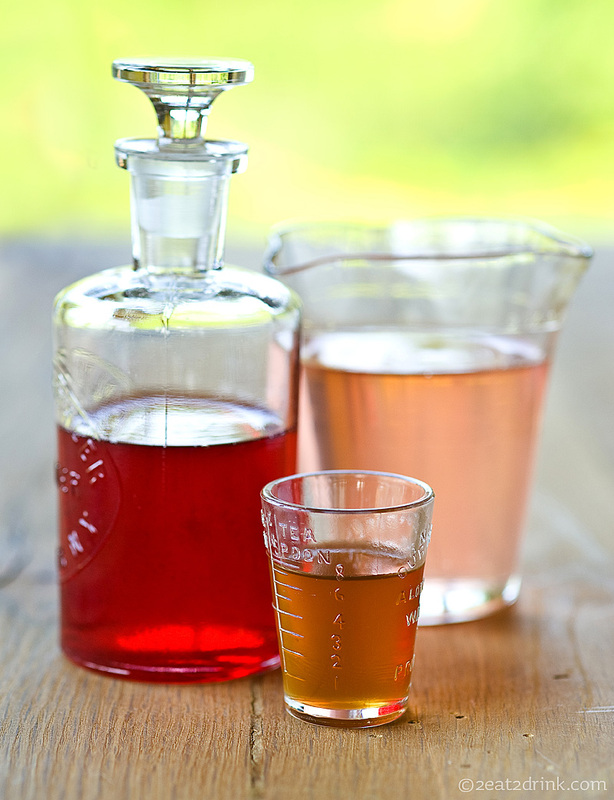 Making simple syrup is as easy as the name implies. Combine equal parts water and sugar in a saucepan. (We typically use one cup of each, and sometimes use brown sugar rather than white.) Bring the mixture just to a boil, reduce the heat, and stir until the sugar is completely dissolved. Remove from heat and let it cool completely. We pour ours into bottles and store it in the refrigerator. It has become a staple in our kitchen! Our three simple syrups being infused with flavor! 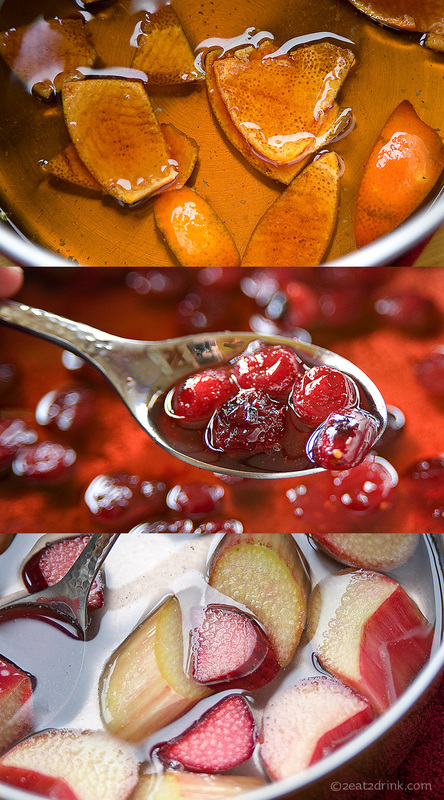 To go with our three sparkling wines, we decided to make three different flavored simple syrups – rhubarb, cranberry cinnamon, and brown sugar orange. Flavoring the simple syrups was quite easy. Once the sugar had dissolved, we stirred in the necessary ingredients. Chopped rhubarb, cranberries that had been sprinkled with cinnamon and roasted for about an hour at 350º, and an orange peel with pith removed (add about half the juice of the orange to the simple syrup, as well) were our ingredients of choice. It was then time to take each of our three saucepans off the heat and let them sit for an hour. We strained the simple syrups into containers, let it all come to room temperature, and chilled it before use. Feel free to get creative with your flavoring, using nearly any spice, herb, or fruit you desire. The finished syrups look as good as they taste. 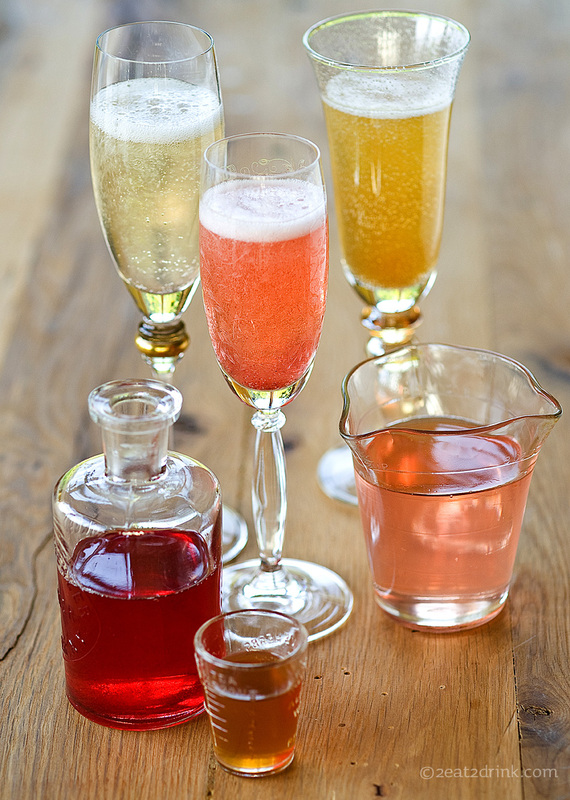 To create the cocktails pictured, pour one to two ounces of flavored simple syrup (depending on how sweet you like it) into a champagne flute then top it off with sparkling wine. The Chateau Frank Blanc de Blancs mixed nicely with the rhubarb-flavored simple syrup. The Swedish Hill Riesling Cuvée was superb with the cranberry cinnamon simple syrup. Our favorite combination was the Hunt Country Chardonnay Champagne with the brown sugar orange simple syrup. The deep caramelized flavors of this wine paired nicely with the brown sugar and citrus of the simple syrup, making for a deliciously decadent sparkling treat. 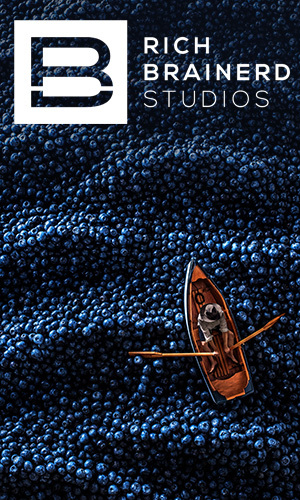 We hope you get a chance to enjoy some of the many delicious sparkling wines that our region has to offer, whether on their own or in your favorite drink recipe. And, if you haven’t done so already, pick up a free copy of CITIZEN. Cheers! This delicious retro treat came to us from my in-laws’ trip to Nashville. 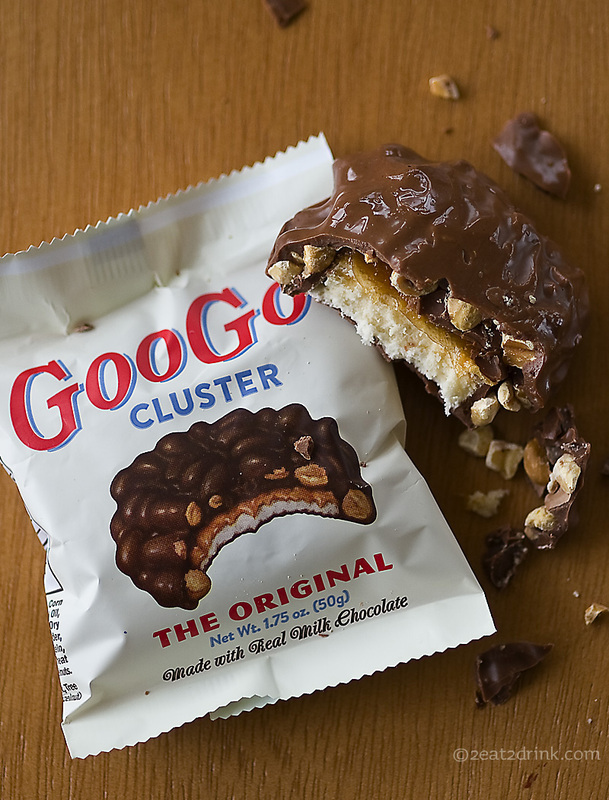 Milk chocolate, caramel, peanuts and marshmallow…..how can you go wrong?! 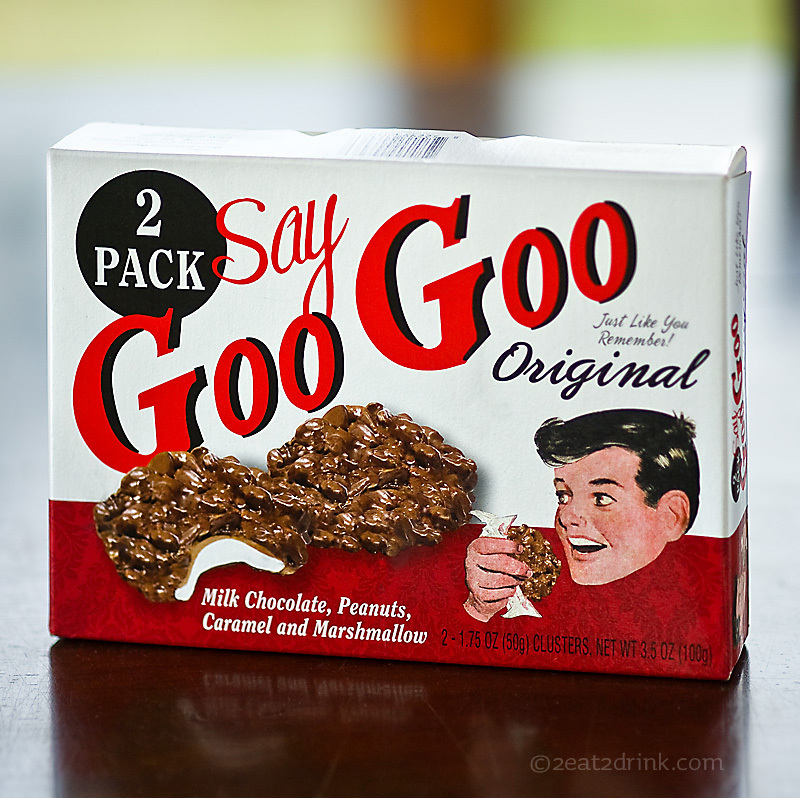 They were so good, we have been tempted to take a road trip and get some more. Here’s to being a kid again! I know it’s a couple days early, but it seemed like a Good Friday to do a post. 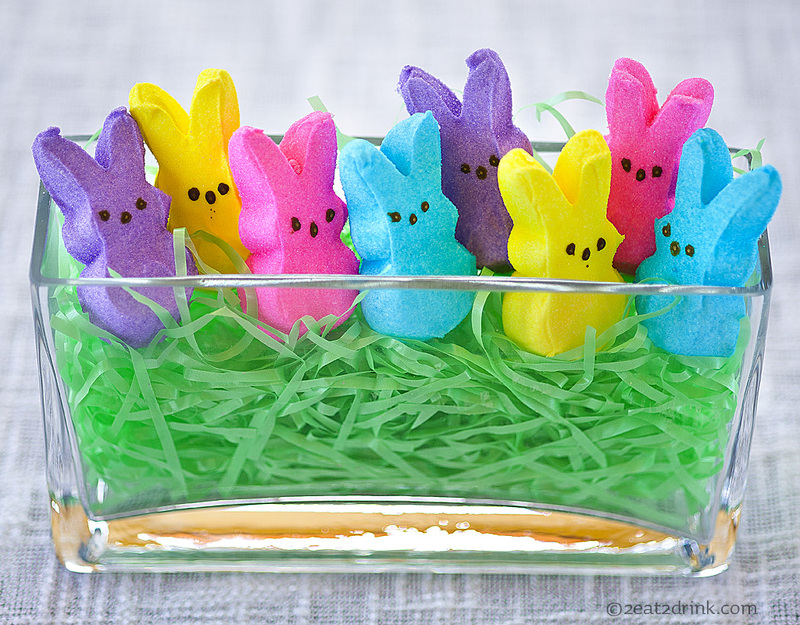 We just wanted to say Happy Easter to all our, um, peeps out there. We hope the Easter Bunny delivers some sugar-coated marshmallow bliss. Enjoy the time with your family! The slang definition of fresh may be fashionable or cool. The actual definition is: not stale, sour, or decayed. We think both meanings apply to this fresh Asiago! If you can find it, we suggest you give it a try. 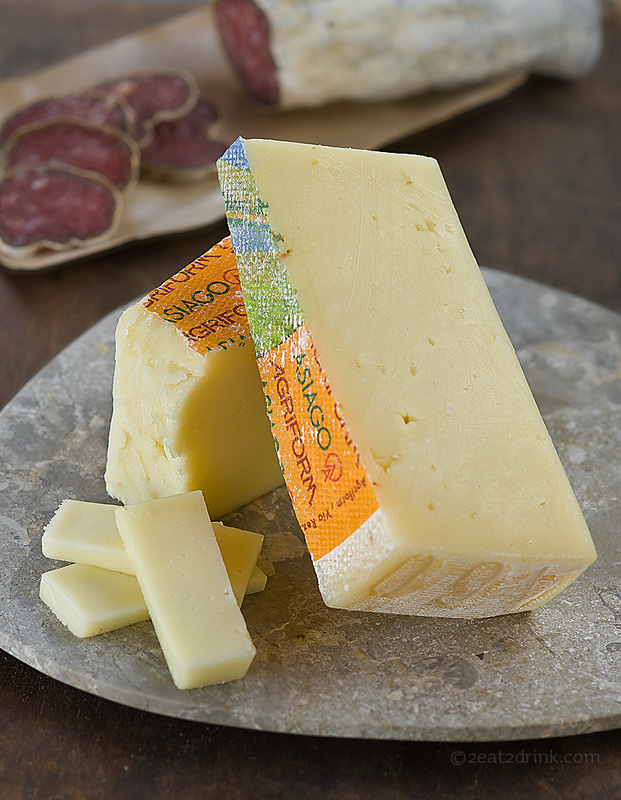 Fresh Asiago (AKA Pressato) is a totally different experience from the mature variety (Asiago d’Allevo). It’s lighter (in both taste and color), creamier, and milder than mature Asiago. The fresh variety is made from whole cow’s milk (as opposed to partially skimmed) and is aged for only 20 – 40 days (instead of 3 – 12 months +). Creminelli Wild Boar salami! We’d been wanting to try this for quite some time. You may not normally think to pair this with such a light cheese and wine, but they really did all compliment one another very nicely. The tanginess of the salami paired with the citrus notes in the wine, and its surprising creaminess went well with the fresh Asiago. This delicious salami was salty, creamy, spicy, and milder than expected. On a side note… the juniper in the wild boar salami reminded us of gin, so we couldn’t help but pair it with a gin and tonic after finishing our cheese/salami/wine tasting. This was excellent, as well! None of these would be “suggested” pairings for the others. But….this tasting was a great example of finding common characteristics (such as the creaminess of this cheese, salami, and wine) that become apparent as you taste them together. Let us know what your favorite “unusual pairings” are. 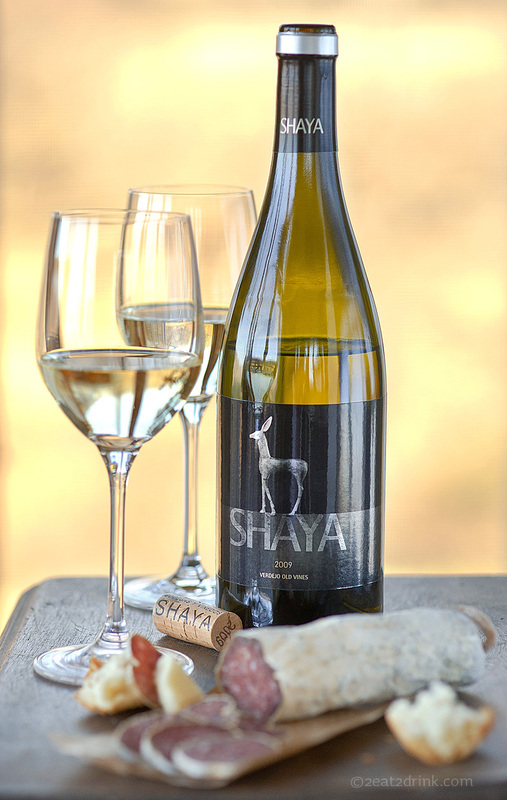 91 point 2009 Shaya Verdejo. 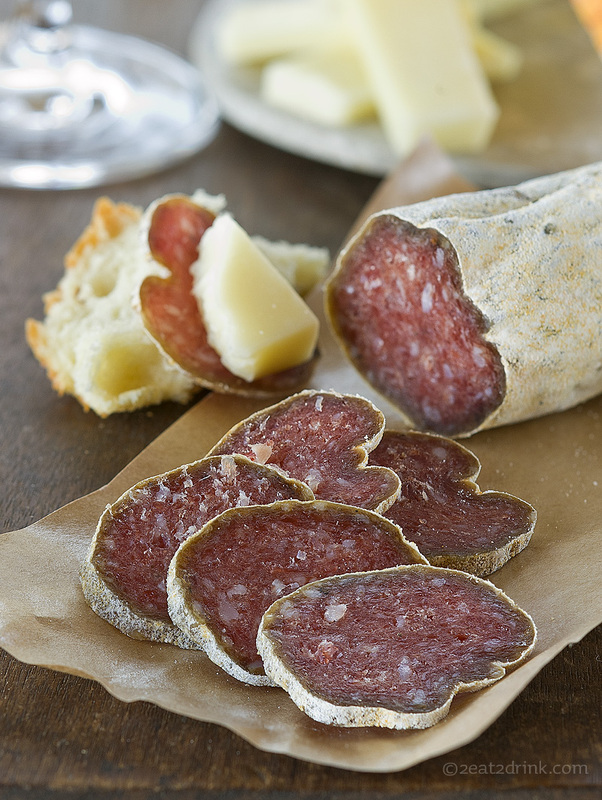 Creminelli Wild Boar Salami. A fresh pairing idea! 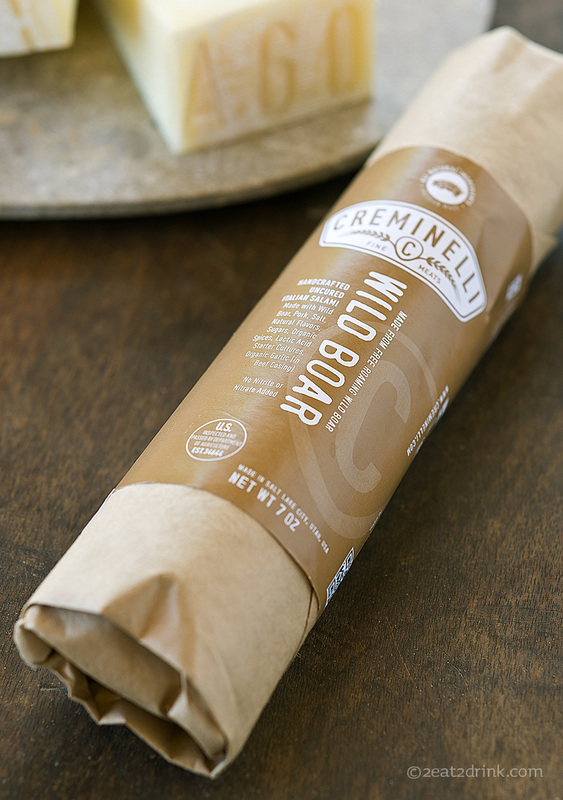 Creminelli Wild Boar Salami, as you'll find it in the store.